feet of exterior plaster, and about two miles of HV DC power cable. The capacity per elevator is 21 passengers. the famed tower of Los Angeles City Hall . year Mickey Mouse made his movie debut. 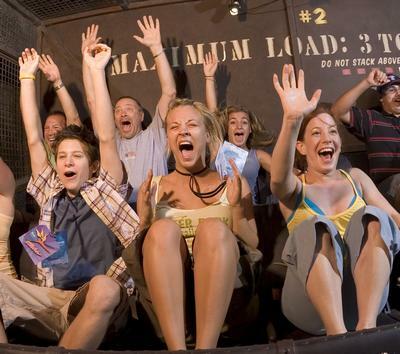 Terror� and was created specifically for the attraction. the story of a little boy who can read minds and control people. � winner, wrote 92 of the original 156 episodes. Ellington, which were all chosen for a certain timeless, haunting quality. there are props and design elements that recall specific episodes. anything with them – and never came back. filled with photos and personal effects. by tiny creatures that turn out to be the crew of a spaceship from Earth. This design indicates a doorway into another dimension. seen from the Sun Plaza of Disney’s California Adventure. 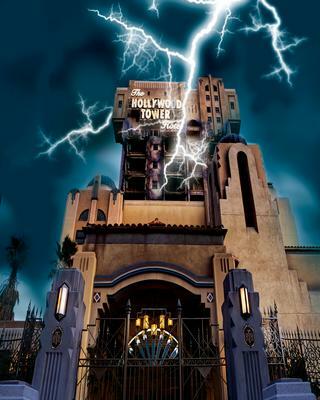 stormy night, long ago� as they rode the elevator to the top of the tower. 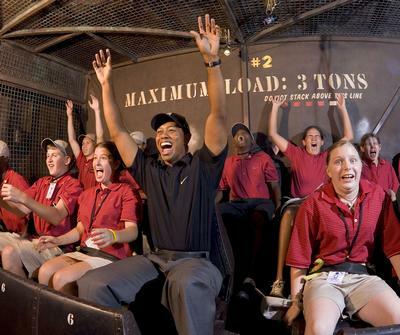 Guests to the attraction are invited to repeat their journey, if they dare. is characterized by the clean, geometric shapes common to the Art Deco style. look of the landscaping to accompany the tone established in the architecture.